It’s true. I was both bewildered and distressed over one particular thing more than any other as I adjusted to life in the Czech Republic: How am I going to get by without thrift stores?! I’m referring to the kind of thrift stores with other peoples’ unwanted furniture and housewares. I live off of them. They delight me, inspire me, and allow me to have a smashing pad on a small budget. In Prague, “Secondhand” on a store front means clothes, and the most popular way to get rid of unwanted furniture is to put it on the street. While I do love a good trash find, I can’t very well spend my days scouring the city streets. Happily, I seem to be a moth to light in finding friends who are also interested in secondhand furniture and housewares, and I’ve been pointed all over Prague and the surrounding area to some great places. Many of them are in old barns and warehouses, so bundle up if you’re heading out to explore during the winter. This is one of my favorite corners of the earth. It’s a treasure trove of garden and stoneware accessories, wooden doors, old teacups and tea sets, kitchenware, used and repaired furniture, antiques, and replicas. There are four large spaces on the grounds packed with goodies and furniture. None of the spaces are heated in the winter; I nearly lost my fingers to the cold the first time I went, but it would have been worth the loss. My personal favorite is the main space packed with bric-a-brac, because, well, I love digging for junk. Furniture prices aren’t always a bargain, but you won’t go broke, either. You have to get to Antik Nábytek Spomyśl by car, but it’s worth bribing a friend if you don’t have one, or making friends with someone who does. Seriously. Scout out someone with wheels, and charm your way into their life, then convince them to take you here. There is also a two-story warehouse down the road with more furniture in “original condition,” meaning it’s not perfect and might need some work. Sometimes you can just ask to pop in to the warehouse, otherwise, they ask that you make an appointment. Be ready to show off your Czech — the staff only speaks a little English. A visit to Nábytková Farma is a win-win. The prices are affordable on a budget, and 100% of the profits go to a non-profit residential center, Betel, that houses, trains, and rehabilitates recovering addicts and alcoholics. The store is in an old barn, and everything in it is donated. The selection isn’t terribly extensive, so it’s a bit hit-or-miss whether you’ll find something you have to have. However, they do have a little of everything, from wardrobes, to kitchenware and housewares, to sofas. Some of the pieces are perfect as-is, like a number of beautiful wood buffets (3500-3900 CZK), a vintage solid wood wardrobe (1900 CZK), and a sweet black china cabinet with leaded glass panes (1400). Other pieces are a job for a DIY-er with a vision, like a wood-framed loveseat/chair set with tufted mauve velour upholstery (3600 CZK). A little spray paint on the frame and it could be a cute set in a sunroom. I walked away with a standing drum-shade lamp for 350 CZK, and a set of four deco landscapes for 360 CZK. Another reason to remember Nábytková Farma is that if you have donations, they’ll come get ‘em. They do pick-ups and removals at no charge, and are even happy to deliver on their next run to your neck of the woods if you find something you can’t fit in your car while you’re in. One more thing to note: despite the hours listed online, they were actually closed when we pulled up. But if someone is on the property and you can get their attention, they’re incredibly nice and were happy to give you a look around. The staff speaks fluent English. This charming little place is in Horoměřice, just outside of Prague. The first of three spaces of what seems like an old farmhouse has great housewares, nice chests of drawers, and plenty of wooden trunks. This is a great place to look for interesting statement pieces for added detail in a room, like wooden antique spinning machines and old farmhouse equipment, a pair of white wooden columns, or a wooden birdcage. I’m half-tempted to start collecting old board games and children’s toys just because I know where to find them now. They also have some nice stoneware accents and planters for the garden. An added bonus here is that no digging is required – it has the feel of a shop and everything is arranged well. Prices are decent, and pieces are quality – they won’t require any work or cleaning up. These two warehouses (one in Žižkov and one in Vršovice) are a total find for bargain-hunting DIY-ers. They’re the kind of places you should drop in to whenever you’re in the neighborhood because you never know what you’ll find. Though there were plenty of forgettable pieces, I also found some really fun, unique treasures: a checkerboard Moroccan pouf for 200 CZK, a wood cocktail cart on wheels with a fold-out mirrored shelf (sweet!) 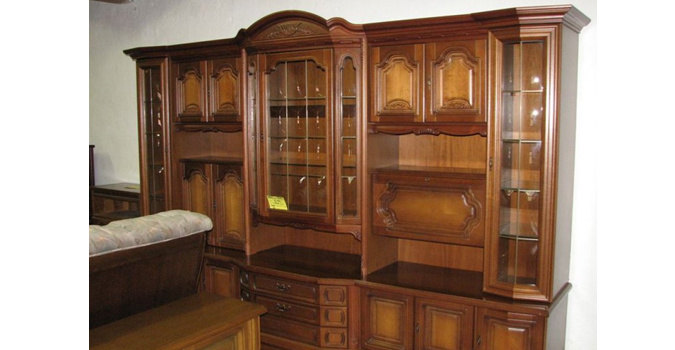 for 1200 CZK, and a lovely light wood, four-door sideboard for only 600 CZK. Mind you, it was missing two panes of glass, and the center doors were locked without a key, but if you’re resourceful, it was cute and a total bargain! So while much of the furniture needs a bit of attention, the prices are incredibly affordable. There are lots of wooden and upholstered stool pairs for easy extra seating in the living room, a section of mid-century modern furniture, coat racks, and wood wardrobes and dressers. There’s also a section of fairly unimpressive kitchen cabinets, but it might be worth a peek if you’re re-doing a kitchen. 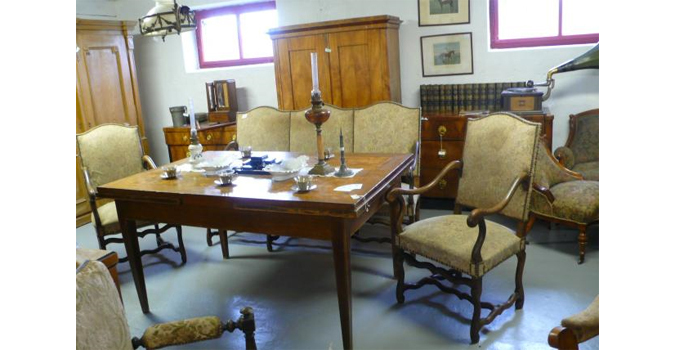 This Karlín warehouse is full of quality antiques at quality antique prices. Personally, I’ve never found anything I’ve fallen in love with, though maybe it’s the prices I’ve not fallen for. 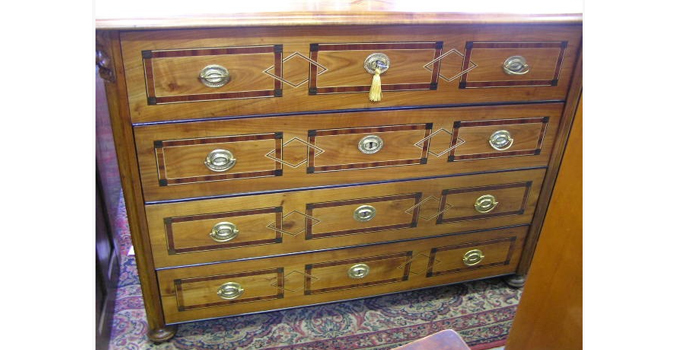 A tall seven-drawer grey dresser with white ceramic knobs had a sticker of 18500 CZK. A small round metal side table covered in cowhide was marked 14000 CZK. A solid black metal chest wasn’t bad at 800 CZK. 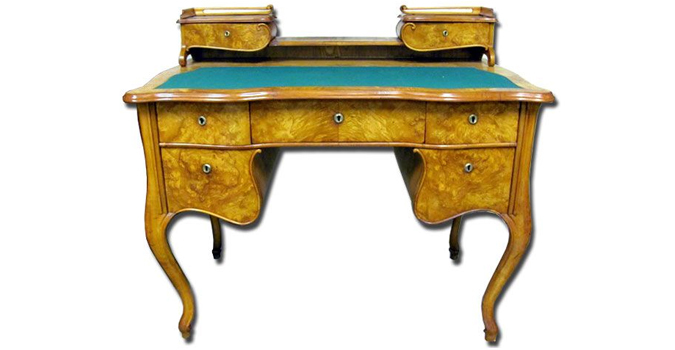 There is definitely a good selection of interesting pieces, ranging from 1950s-era chairs to antique china cabinets with detailed wood inlays. There are some new, raw and unfinished pieces, a fair number of outdoor chairs and tables for the garden, and again with the cowhide – a pair of tubular chairs that have been recovered in Bessie. They’re quite stylish, really. I’d just be afraid they might buck me. For the walls, there’s a lovely collection of original landscape and portrait oil paintings. How can a charming four-story farmhouse not beckon you in? The building, however, is mostly full of out-of-date, out-of-style furniture. Picture lots of overstuffed sofa and loveseat sets with bad upholstery. But my favorite thing about Holandský Nábytek Best is the occasional stylish piece tucked among the grandma furniture that could be incorporated into many a room. For example, a set of four round-backed upholstered Victorian dining chairs (7800 CZK), a beautiful white leather upholstered wingchair with nailhead trim (5800 CZK), and a white wood TV cabinet on sale for 1000 CZK. They do have plenty of quality wooden antique pieces, and the prices are reasonable, though still high for anyone on a budget or just passing through Prague. Holandský Nábytek Best has a charming Czech-speaking staff to match the charming yellow building. They also offer re-upholstery services, and have a limited selection of fabrics. There’s a decent collection of oil paintings near the front, plenty of fabulous upholstered, metal, and wood benches from all eras, and fantastic chair collections for dining or reclining. I spotted a pair of leather tufted cube armchairs (9500 CZK) that are dying for a men’s smoking lounge to call home. A stylish metal cocktail cart (4500 CZK) would add pizzazz to any room. I could keep going – a retro fireplace grate, metal bed frames, busts, tubular chair sets, a crystal cube light fixture, and an oversized painting on paper that’s fraying at the edges. I need a bigger allowance. Whatever treasure you find, you can take home and put in place right away. With the possible exception of a bit of dust, the pieces are all in excellent condition. You pay for the quality, so these are going to be investment pieces. Personally, I’m really happy with some of the treasures I’ve found in my scouting treks. A shabby farm stool in my modern bathroom is a fantastic contrast. A pair of small black chests were an affordable solution to bedside tables. And I finally have some art on the living room walls with my deco print set! Whether you’re in Prague for a year, for ten, or forever, all of these places offer pieces with charm, character, and history. Have any shops to add? Leave them in the comments… I’d love to discover more! I’ve always loved the process of making things work in a space, and figuring out how to make rooms feel and function the way you want them to, both in organization and decor.